This review has been printed in the November 2017 issue of Chess Life. A penultimate (and unedited) version of the review is reproduced here. Minor differences may exist between this and the printed version. My thanks to the good folks at Chess Life for allowing me to do so. Fishbein, Alex. 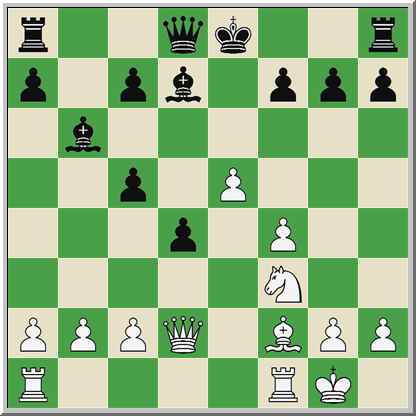 The Scotch Gambit: An Energetic and Aggressive System for White. Milford: Russell Enterprises, 2017. ISBN 978-1941270745. PB 128pp. Astronomers and astrophysicists often speak of a “Goldilocks Problem” when discussing the origins of life in the universe and the search for life beyond our own Solar System. There seems to be a fairly narrow “habitable zone” – neither too hot nor too cold, neither too close to their home stars nor too far away – if planets are to be able to support life. Lucky for us, the Earth is juuuust right in its relation to the Sun! Chess authors have their own version of the “Goldilocks Problem,” and we see it most clearly when we consider the competing difficulties in writing an opening book. It’s a tricky balancing project. Authors have to include enough analysis to make their case, but not so much that they overwhelm their readers. The analysis should be objective, but a bit of advocacy is necessary too. Why should a reader spend time learning your lines if it’s clear that you don’t really believe in them? There have to be enough words to explain the rationale for repertoire choices, but not so many that the book seems flip or frivolous. The variations should be solid and sound, containing enough poison to play for a win without shading into too much speculation. The book should be concise without sacrificing coverage, and it (ideally) should teach you something about chess beyond any specific opening system. Now, no book is perfect. But some are better than others at searching out this sweet spot and trying to inhabit it. One of the best books I’ve seen in recent months, and one that checks most of the boxes listed above, is Grandmaster Alex Fishbein’s The Scotch Gambit: An Energetic and Aggressive System for White, newly published by Russell Enterprises. Fishbein, the author of two previous books (King and Pawn Endings in 1993 and Fischer! in 1996), was a very active player in the early 1990s, but he put aside his professional chess career and entered the world of high finance. Never fully giving up the ghost, Fishbein has in recent years dipped his toes back into competitive play with greater and greater regularity. 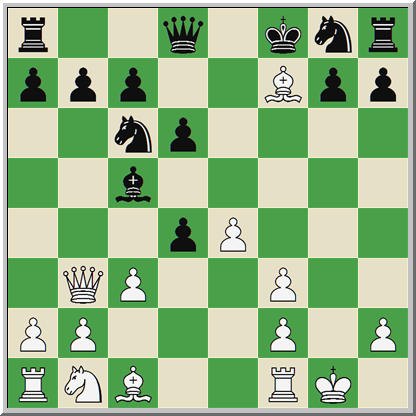 The Scotch Gambit offers its readers a complete repertoire for White after 1.e4 e5. The final chapter deals with the Petroff and Philidor Defenses along with the Latvian and Elephant Gambits, but by and large, this is a book about how to answer 1.e4 e5 2.Nf3 Nc6. This is no small problem for 1.e4 players right now. 1. …e5 is hugely popular at elite levels, as we saw in my May column, and this trend trickles down through to the amateur ranks. Difficulties in cracking the Berlin and Marshall have driven White players towards the hoary Giuoco Piano, which (if we’re honest) is hardly inspiring stuff. Fishbein’s answer is to bypass all of this by playing 3.d4 exd4 4.Bc4, entering into positions where White offers a pawn to gain attacking chances. There is theory here to learn, of course, but the field is delimited and White can try to channel the game into positions he knows better than his opponents. At just 128 pages, The Scotch Gambit is a surprisingly dense book. Each of its ten chapters begins with a theoretical overview of critical variations, followed by a set of supplementary games that expand and unpack that analysis. Not all of the illustrative games show victories for White, which to my mind is rather useful. Sometimes a ‘cautionary tale’ can prove more enlightening than a dozen typical miniatures. There is plenty of analysis for even master-level players in The Scotch Gambit, but for me, the emphasis on explanation is what distinguishes Fishbein’s book from its competitors. After 1.e4 e5 2.Nf3 Nc6 3.d4 exd4 4.Bc4 Black has two main options: 4. …Nf6 and 4. …Bc5. Chapters 1-5 of The Scotch Gambit deal with 4. …Nf6, while Chapters 5-9 explore responses to 4. …Bc5. We’ll take each in turn. The first two chapters of the book deal with what Fishbein calls the Modern Attack: 1.e4 e5 2.Nf3 Nc6 3.d4 exd4 4.Bc4 Nf6 5.e5 d5 6.Bb5 Ne4 7.Nxd4 Bd7. There are two points here worth mentioning. (1) White often chooses between two 5th move options in this variation: 5.e5 and 5.0-0. Fishbein makes a cogent case for the superiority of 5.e5, and in chapter 5, he shows why this is the case. Recent analysis by Lokander and Ntirlis prove that Black is fully equal, if not potentially slightly better, after 5.0-0 Nxe4 6.Re1 d5 7.Bxd5 Qxd5 8.Nc3 Qd7! “Unusual” is 12.0–0 Ba6! (12…Rxb2 was seen in Nakamura-Onischuk, Saint Louis 2015) 13.Re1 Rxb2 14.Qd4 Rxc2 15.Na3 Nb3 16.axb3 Rxc6=. 12. …Qxd5 13.Bxd5 Rxb2 14.Na3! with the idea 15.0–0–0. While there are a lot of move orders issues to consider, as is true throughout the book, the key position of the Modern Attack appears after 7. …Bd7 8.Bxc6 bxc6 9.0–0 Bc5 10.f3 Ng5 11.Be3 Bb6 12.f4 Ne4 13.Nd2 Nxd2 14.Qxd2 c5 15.Nf3! d4 16.Bf2 and now Black has a choice of moves. After 16. …Bc6 (keeping the option of castling queenside alive) Fishbein persuasively argues that White should play 17.f5! as in Stopa-Schneider (Richardson, 2007). Other moves are imprecise: 17.Bh4 allows 17. …Qd7, fighting for the f5 square, and in the case of 17.a4 a5 18.f5 Qd5 19.Qg5?! (better is 19.Bh4) 19. …h6! 20.Qxg7 0–0–0! Black is for choice. The main line runs 17. …Bxf3 (if 17. …Qd7? 18.e6!, and after 17. …Qd5 18.Bh4!) 18.gxf3 Qd5 19.Qg5 when the White king is safe enough and Black has trouble castling. What about 4. …Bc5? Here Fishbein provides two alternatives for readers to consider. White can play 5.0-0! ?, leading into the Max Lange Attack (Chapter 6) after 5. …Nf6 and the “von der Lasa” variation (Chapters 7-8) after 5. …d6 6.c3 Bg4 7.Qb3. Alternatively, if White desires a quieter game, he can try the Jobava variation – 5.c3 Nf6 6.e5 (6.cxd4 Bb4+ is the Giuoco Piano) 6…d5 7.Be2 – recently popularized by GM Baadur Jobava and analyzed in Chapter 9. I think the choice between these two moves comes down to whether you believe in Fishbein’s rehabilitation of the von der Lasa. This is a very old variation, analyzed years ago by Steinitz and Cordel, and more recently by Lev Gutman in Kaissiber. While Black can vary with 6. …dxc3, 6. …Nf6, and 7. …Qd7, the key line runs 1.e4 e5 2.Nf3 Nc6 3.d4 exd4 4.Bc4 Bc5 5.0–0 d6 6.c3 Bg4 7.Qb3 Bxf3 8.Bxf7+ Kf8 9.gxf3. Here White has avoided the faulty 9.Bxg8? Rxg8 10.gxf3 g5!, but is faced with a multitude of decent choices for Black, including 9. …d3, 9. …dxc3, 9. …Bb6, and the most popular move, 9. …Nf6. Fishbein tries to show through creative analysis that the von der Lasa is ultimately unclear, with neither side able to truly claim an advantage. I think this is slightly optimistic. For example, if Black tries the untested 9. …d3!? 10.Be3 Ne5 11.Bxg8 Rxg8 12.Nd2 Qh4, White is under pressure but probably should hold. Fair enough. But what about 11. …Re8, with the idea of Re8–e5–h5? Fishbein gives 12.Qd1 (12.Bf4? g5) 12. …Re5 13.Kh1 (13.h4!?) 13. …Rh5 14.Rg1 as “an unclear position in which Black can easily get overextended.” (78) To me this sounds like a tacit admission of Black’s superiority, and I’d much rather play Black in this position. That Fishbein is slightly overly optimistic for White, here and elsewhere, is not surprising. He plays these lines himself, so I’d hope that he believes in them! From my perspective, this is the only drawback to the book, and it’s a slight one indeed. There are a couple of minor editorial lapses – three moves are missing on page 101 – and small analytical improvements found by the computer, but on the whole, this is a work of very high quality. The Scotch Gambit is an excellent book, filled with interesting ideas and sharp analysis. What makes it special is the clarity of Fishbein’s positional sketches and descriptions. It avoids all the extremes of the opening book genre, and in so neatly tying together analysis and exposition, Fishbein has written the rare book suitable for both amateurs and masters. This entry was posted in Instructional, Openings and tagged Alex Fishbein, Fishbein, Russell Enterprises, The Scotch Gambit on November 3, 2017 by fullcityplus.